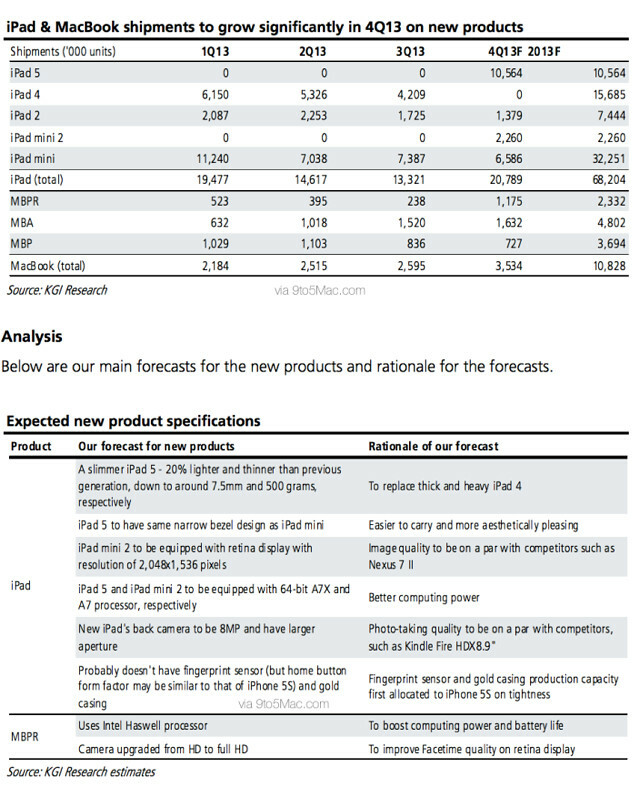 The often accurate KGI Securities analyst Ming-Chi Kuo has released his predictions for the Apple event on October 22nd. Kuo says the iPad 5 will be 20% lighter and thinner than the previous generation bringing it to around 7.5mm in thickness and 500 grams in weight. It will have the same narrow side bezel design as the iPad mini and be equipped with a 64-bit A7X processor. The tablet will also get a 8MP back camera with a larger aperture. The iPad mini 2 is said to gain a Retina Display at a resolution of 2048x1536. It will be equipped with an A7 processor. Neither iPad is said to come in the gold color or with a fingerprint scanner. Kuo says the rationale is "Fingerprint sensor and gold casing production capacity first allocated to iPhone 5s on tightness". Apple is also predicted to update the MacBook Pros with an Intel Haswell processor and a better full HD camera. The processor update will boost computing power and battery life. Although not covered by Kuo, Apple is also rumored to possibly release OS X Mavericks, Mac Pros, and an updated Apple TV.